Scars from acne are a two‐fold blow to self‐confidence: First, you have to endure the unsightliness of the pimples and, afterwards, deal with the marks as a reminder. Unlike other kinds of scar, acne scars often leave deep, irregular pits that are not as responsive to creams and other topical applications like regular scars. Even with aggressive medication, the scars may not respond well due to the fact that different kinds of acne leave different kinds of scars. A skin care specialist should be able to recommend the right kind of treatment after examining the scars. Pimples or lesions caused by acne occur when the hair follicles or pores on the skin become clogged with oil and dead skin cells, bodily wastes that are normally eliminated via the same channel (pores). A clogged pore, however, is an inviting breeding ground for bacteria, which in turn creates pus‐filled red bumps we abhor as pimples. There are three levels of severity of acne. The mild type is the occurrence of whiteheads & blackheads that many of us experience at various times. Moderate acne is when pimples become red and inflamed, and develop white centers called pustules. The really acute case causes painful, pus‐filled lumps (called nodules) to erupt. It is this type of acne that leaves the most serious scarring, with the nodules likelier to cause permanent scars compared to other types of acne. developing deeper scars. These unwanted pits, however, no longer need to be endured; different treatments are available for different scars in aesthetic clinics in Singapore. Acne scars become more visible as a person gets older because the skin loses collagen, that all‐ important material needed to maintain supple skin. Key to minimizing the appearance of scars is choosing the kind of treatment suitable to the scar type. For example, deep scars can be treated by fillers that add volume to the skin, while moderate scars can be zapped by laser resurfacing performed in laser clinics. 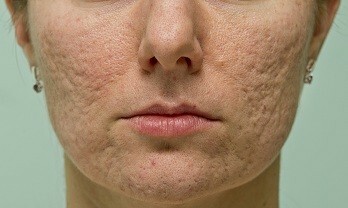 A chemical peel or microdermabrasion often works on mild acne scars to help diminish their obvious appearance. For really serious scars, a laser resurfacing technique such as Cutera Pearl, a popular FDA‐approved treatment done in a medical clinic in Singapore, may be more suitable. This non‐invasive procedure is performed using laser to remove the damaged top layer of the skin while stimulating the deeper layers to produce collagen. Skin replacement occurs in less than one week, and often only or two treatments are needed to achieve desired results. Dermapen is another treatment that effectively reduces mild to severe acne scars as well as surgical scars. It works by using micro needles which stimulates the body’s own collagen production in turn creates healthier looking skin. On the other hand, “rolling” scars respond well to injectables that are placed under the scar to raise it to normal skin level. The really deep scars can be remedied by filler injections that may be repeated over a period of time as fillers are reabsorbed into the skin and the scars start to show again.